A View From The Royal Artillery Encampment, Conjeveram. bl.uk > Online Gallery Home	> Online exhibitions	> Asia, Pacific and Africa Collections	> A View From The Royal Artillery Encampment, Conjeveram. Plate thirty six from 'Picturesque Scenery in the Kingdom of Mysore' by James Hunter. 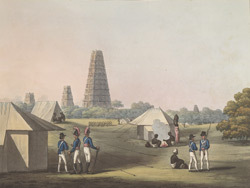 This aquatint is based on a picture by Hunter showing an army encampment in the foreground with the soaring gateways of a temple in the background. Kanchipuram is considered one of the seven most sacred cities in India, on account of the 70 or so temples scattered throughout it. The gateways in the backgrounfd of this picture are probably from the Ekambareshvara Temple, the largest in Kanchipuram, which was erected in 1509 by king Krishnadeva Raya of Vijayanagara.